Alison Marion Lohman (born September 18, 1979) is an American actress. She starred as Astrid in White Oleander (2002), and has appeared in Matchstick Men (2003), Where the Truth Lies (2005), The Big White (2005), Nausicaä of the Valley of the Wind (2005), Flicka (2006), and Sam Raimi's Drag Me to Hell (2009); as well as smaller parts in Big Fish (2003), Beowulf (2007), and Gamer (2009). She has also been on television shows such as Tucker and Pasadena. Lohman was born and raised in Palm Springs, California, the daughter of Diane (née Dunham), a patisserie owner, and Gary Lohman, a Minnesota-born architect. She has one younger brother, Robert (born 1982). At age nine, she played Gretl in The Sound of Music at the Palm Desert's McCallum Theater. Two years later, she won the Desert Theater League's award for Most Outstanding Actress in a Musical for the title role in Annie. She went on to perform locally as a child singer, which included alongside Frank Sinatra at a benefit event in Palm Springs. Lohman excelled in high school, and obtained A letter grades in all her school subjects except drama, because she suffered from shyness. During her senior year, Lohman was an awardee of the National Foundation for Advancement in the Arts. She was offered a full scholarship to attend New York University but declined, opting instead to directly pursue an acting career. The following year, Lohman appeared in Matchstick Men, directed by Ridley Scott, starring with Nicolas Cage and Sam Rockwell. And though it was a moderate box office success, Lohman continued to receive critical praise. Later that year, she appeared in Tim Burton’s Big Fish, which continued her trend of appearing in acclaimed but also a moderate success. Lohman, who is frequently cast as a teenager, has said that she believes she "look[s] younger, but act[s] older" than her age. In 2010, Lohman gave birth to the couple's first child, a boy, named Billy, in Bucharest, Romania, where Neveldine's 2012 film Ghost Rider: Spirit of Vengeance was filming (starring her 2003 Matchstick Men co-star, Nicolas Cage). News of the child's birth was not revealed until August 2011. She has since given birth to a second child. 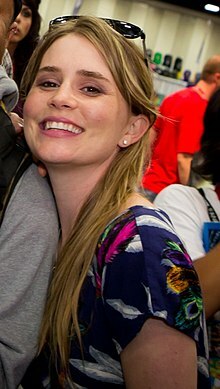 ^ "Alison Lohman Biography" By Rebecca Murray, About.com. ^ Lammers, Tim (September 11, 2003). "@ The Movies Interviews: Ridley Scott, Alison Lohman". Lifewhile.com. Archived from the original on July 13, 2011. Retrieved August 28, 2010. ^ Flynn, Gillian (August 26, 2003). "She's not 14 -- she just acts it around Nic Cage". Entertainment Weekly. Retrieved January 14, 2019. ^ "Improvising and the Brain". Psych Central.com. ^ a b Neumeier, Joel (September 8, 2003). "SHE'S YOUNG BEYOND HER YEARS -- Alison Lohman, 24, plays troubled 14-year-olds with the wisdom of experience". New York Daily News. Archived from the original on January 14, 2019. ^ a b c d Hart, Hugh (October 22, 2006). "San Francisco Chronicle". Horse sense helps Lohman in 'Flicka'. Retrieved October 22, 2006. ^ "Movie & TV News @ IMDb.com – Studio Briefing – August 22, 2005". Archived from the original on November 9, 2012. Retrieved June 25, 2006. ^ "Where the Truth Lies ", Roger Ebert review, October 28, 2005. ^ "2010 MTV Movie Awards Nominees Announced; New Category for Horror". Dread Central. ^ Weiner, Jonah (August 30, 2009). "The Fast and Furiously Lampooned". The New York Times. Retrieved April 23, 2010. ^ "Celebrity wedding in Watertown". MyABC50.com. August 19, 2009. Archived from the original on April 11, 2013. Retrieved March 25, 2013. ^ Benardello, Karen (August 19, 2011). "Alison Lohman Secretly Gave Birth to a Son Months Ago". Shockya.com. Retrieved August 26, 2012. ^ "Alison Lohman: Celeb Moms Who Disappeared From Hollywood After Kids". mom.me. This page is based on the Wikipedia article Alison Lohman; it is used under the Creative Commons Attribution-ShareAlike 3.0 Unported License (CC-BY-SA). You may redistribute it, verbatim or modified, providing that you comply with the terms of the CC-BY-SA.